This is a magazine written by quilters for quilters! 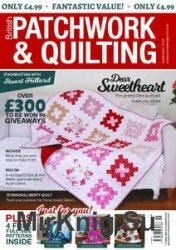 British Patchwork & Quilting magazine is the UK’s longest published, monthly best selling specialist quilting magazine, first published in 1985. Each issue has a wide selection of projects to do with patchwork, quilting, appliqu? or related textiles requiring various levels of expertise and using a variety of techniques. Enjoy in-depth articles looking at the historical aspects of quilting or other aspects of textiles and keep up-to-dat.